Mission 83 - 26 November 1943 to Bremen, Germany in B-17F 42-3064 Star Dust (358BS) VK-I, 2Lt William C. Fort, Jr. Pilot. Was seriously damaged when three German fighters attacked while the bomb run was beginning. Their 20 mm cannons blasted out all of the plexiglass in the Fortress' nose, destroyed one-half of the oxygen system, knocked out one engine, partially wrecked communication equipment and left a gaping hole in one wing. Substitute Navigator 2Lt Harold J. Rocketto, on his first mission, was killed instantly when the aircraft nose was hit. Bombardier 2Lt Charles W. Spencer, was cut on his face by broken glass, his helmet and oxygen mask was torn away, and he lay gasping for breath as frigid winds in the minus 67 degree atmosphere whipped about his face and head. Engineer S/Sgt Grover C. Mullins, attempted to salvo the bombs to no avail. He entered the nose section to check the damage and found 2Lt Spencer bleeding and frozen. He dragged him into the passage below the Pilot's compartment and tried to give him oxygen. "His face was so swollen, I could hardly see his nose," said S/Sgt Mullins. Sgt Mullins then assisted the CoPilot 2Lt McDonald L. Riddick, whose oxygen mask had been shot away and gave him a walk- around bottle. He also assisted the pilot 2Lt William C. Fort, Jr., with his oxygen mask and attempted to thaw his frozen hands. In the meantime, 2Lt Spencer, barely conscious, realized that the enemy fighters were still attacking and struggled back to his nose gun. He remained at his gun until the attacks ceased. After landing, he was unconscious beneath his guns. Arriving back in England, 2Lt Fort, his frostbitten hands so stiff that he could barely manipulate the throttles, made an emergency landing at a RAF airfield at Docking Fort. Waist Gunner S/Sgt James H. Pleasant was slightly injured and was hospitalized. S/Sgt John G. Viszneki (WG) and S/Sgt Howard H. Zeitner (BTG), were treated for frostbite and exposure at the local base hospital. Star Dust was repaired and flown back to Molesworth. S/Sgt Mullins was awarded the Silver Star Medal and was later injured when he bailed out on the Oschersleben mission #98. 2Lt Spencer was awarded the Distinguished Service Cross Medal for his gallantry in action and spent months in hospitals where his wounds were repaired. Mission 98 - 11 January 1944 to Oschersleben, Germany in B-17F 41-24562 Sky Wolf (358BS) VK-O, 1Lt Aubrey L. Emerson (P). The 2Lt Fort Crew CoPilot, Navigator and Enlisted Men were on the mission with 2Lt D.J. DeLaura (B). S/Sgt Howard H. Zeitner (BTG) was Killed in Action. The other nine crewmen became POWs [MACR 1925]. Sky Wolf was in distress at 20,000 ft. before reaching the target. The B-17 peeled off, although all four engines appeared to be functioning, and crashed at Wolsdorf, Germany. Eight credited combat missions flown by 2Lt William C. Fort, Jr.: 75 (8 Oct 1943), 76, 77, 78, 79(AS), 80, 81, 83 (26 Nov 1943). (AS) Credited Abortive Sortie - no bombs dropped. For Mission dates, targets and Mission Reports, see Combat Missions. 2Lt William C. Fort, Jr. (P), Seven Missions (76 to 81) Flown as CoPilot with 2Lt Calder L. Wise as Instructor Pilot. Mission 83 flown as First Pilot. Wounded on mission 83. 1Lt Calder L. Wise (Instructor Pilot) - Flew as CoPilot on 15 credited missions with the 1Lt John W. Hendry, Jr. 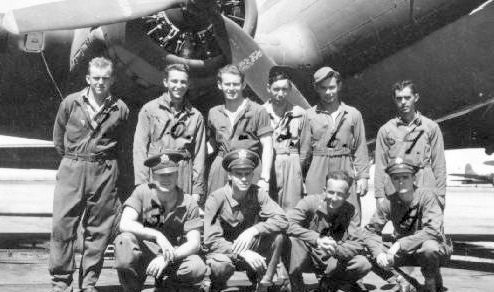 Crew (56, 57, 58, 59, 60, 61, 64, 65, 66, 67, 68, 69, 71(A), 72, 73, 74) and as Instructor Pilot, 2Lt William C. Fort, Jr. (CP) (75, 76, 77, 78, 79 ,80, 81). Also flew on three additional missions (83, 84, 118). 25 mission combat tour completed on 6 March 1944. 2Lt McDonald L. Riddick (CP)(POW) - Flew on one mission with the 2Lt Fort crew (83) and on eight missions as CoPilot with three other Pilots: 2Lt Paul W. Campbell (79, 80); 2Lt Harry A. Schwaebe (88, 89); 2Lt Aubrey Emerson (91, 93, 98). Became a POW on mission 98. 2Lt John P.D. Nothstein (N)(POW/Rep) -Flew on 16 credited missions: Six with 1Lt Fort (75, 76, 77, 78, 79, 80). Two with 1Lt John R. Johnston Crew ( 81, 86). Three Lead Crew missions, Maj Kirk R. Mitchell (P) - (87, 91, 97); Two with 1Lt Arni L. Sumarlidason (73, 74), Three with 1Lt Paul W. Campbell (95, 96, 98). Was a repatriated POW on mission 98. 2Lt Charles W. Spencer (B)(WIA) - Flew on 14 missions - Two of the 2Lt Fort missions 80, 83). 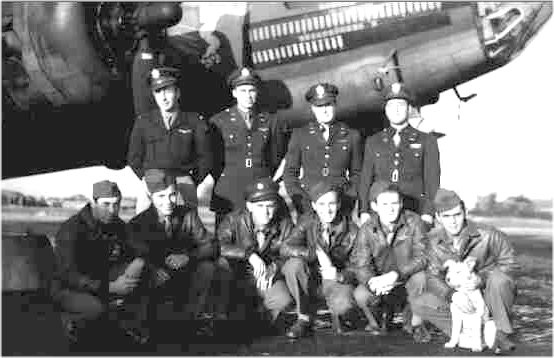 Twelve with three other Pilots: 1Lt Frank H. Thompson (55, 56, 57, 61, 64, 65, 67, 68, 69); 2Lt Daniel A. Shebeck (59); 1Lt Arni L. Sumarlidason (73, 74). Wounded on mission 83. Awarded the Distinguished Service Cross Medal. 2Lt J.B. Lewis Halliburton (B / N)(POW) - Flew on 16 missions - Six of the 2Lt Fort missions - As Bombardier (75, 76, 77, 78, 79); As Navigator (81). Ten missions with five other Pilots (80, 83, 86, 87, 88, 91, 93, 94, 95, 98). Became a POW on mission 98. T/Sgt Grover C. Mullins (E)(POW) - Flew on 13 missions - All 8 of the 2Lt Fort missions. Five missions with other Pilots (87, 91, 93, 94, 98). Became a POW on mission 98. Awarded the Silver Star Medal on mission 83. T/Sgt James C. Supple (R)(POW) - Flew on 14 missions - Seven with 2Lt Fort (75, 76, 77, 78, 79, 80, 83). Seven with other Pilots - Lead Crewman (81, 84, 87, 94), Regular crewman with 1Lt Aubrey Emerson (91, 93, 98). Became a POW on mission 98. S/Sgt Howard H. Zeitner (BTG)(KIA) - Flew on 12 missions - All 8 of the 2Lt Fort missions. Four with other Pilots: Maj Kirk R. Mitchell Lead Crewman (94), 2Lt Aubrey Emerson (91, 93, 98). Was Killed in Action on mission 98. S/Sgt James W. Pleasant (WG)(POW) and S/Sgt John G. Viszneki (WG)(POW) - Flew on 13 missions - All 8 of the 2Lt Fort missions. Five with other Pilots - Lead Crew Pilots (87, 94), 2Lt Aubrey Emerson (91, 93, 98). Became POWs on mission 98. S/Sgt Bernard J. Sutton (TG)(POW) - Flew on 12 missions. All 8 of the 2Lt Fort missions. Four with other Pilots - 1Lt Lester A. Lake (87), 2Lt Aubrey Emerson (91, 93, 98). Became a POW on mission 98.